Import any data type, demultiplex, trim, filter, assemble or map to reference. Raw data straight off the machine? Assembled results from a sequencing vendor? Analysis output from bioinformatics pipelines? Geneious Prime has it all covered. 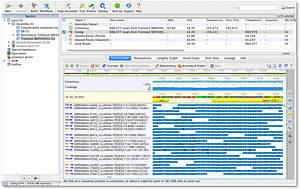 Simply drag and drop to import FASTQ, FASTA, BAM, VCF, GFF and other formats from almost any sequencing machine including Illumina, PacBio, Nanopore, Ion Torrent and 454. The exclusive Geneious Read mapper with its iterative approach produces superior results when compared to other popular mapping algorithms and can correctly align structural variants. If you need something a bit different, Bowtie, TopHat and BBMap are all at your fingertips. The Geneious Assembler is ﬂexible enough to handle data from any type of sequencing machine with reads of any length, including paired-reads and mixtures of reads from different sequencing machines. It’s particularly good for microbial assemblies with the unique capability to produce circular contigs. Alternatively, running MIRA, SPAdes, Tadpole or Velvet is just as easy, and MAUVE genome alignment is on hand to help you with genome comparison and finishing. De Novo Assembly – Learn how to perform a de novo assembly of short read NGS data, how to work with paired-end data and check quality of an assembly against a reference sequence. Assembling Chromatograms – Learn how to assemble and edit chromatograms for downstream analyses. DNA Forensics – The aim of this module is to edit and analyse some “raw” DNA sequence data to determine the origin of a biological sample from a wildlife forensic case. Circular De Novo Assembly – In this study two mitochondrial genomes are assembled from short-read NGS sequence data using the Geneious de novo assembler and the results compared with assemblies produced by Velvet, MIRA and SPAdes. 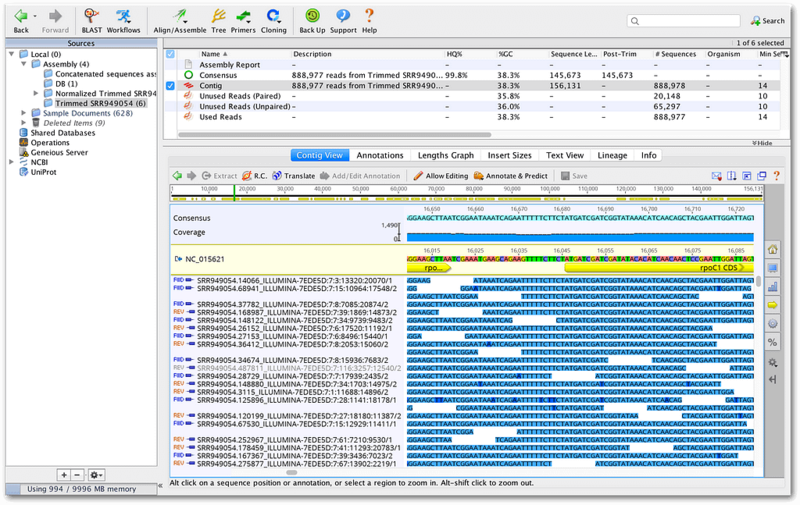 De Novo Assembly of a Bacterial Genome – A workflow for assembly and annotation of a bacterial genome from Illumina MiSeq data. 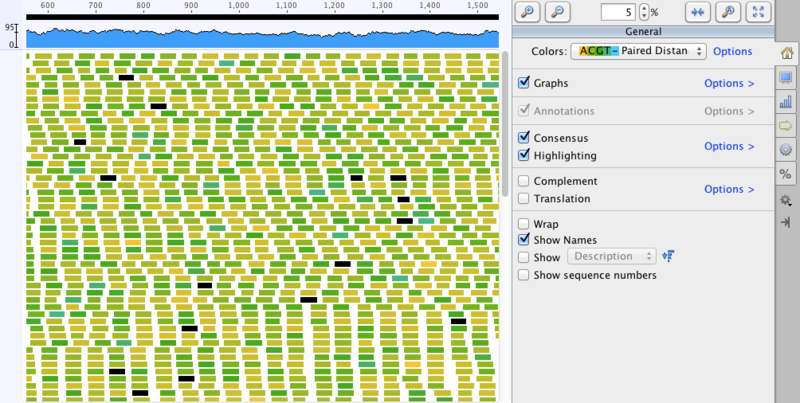 De Novo Assembly of Chloroplasts – Use Geneious Prime to reconstruct a complete, circular, annotated chloroplast genome from a short-read NGS data set. Identification of Zika Virus – Explore a pipeline which allows accurate identification and analysis of low concentrations of ZIKV from high-throughput metagenomic data. 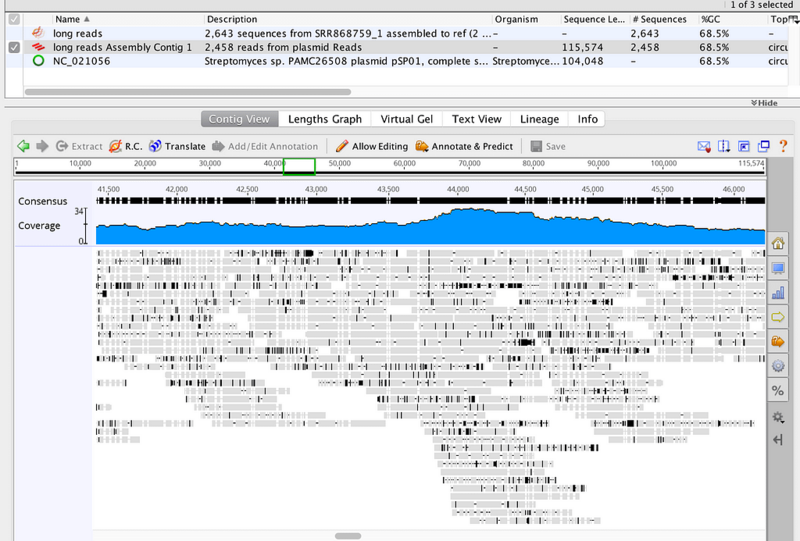 BLAST / NCBI – Connect to NCBI and PubMed, submit sequences directly to GenBank, BLAST sequences and search your own database. Geneious is an absolutely beautiful package to work with. We love it and we are telling everyone about it. We bought Geneious to work with Illumina datasets, and were delighted in its power and intuitive interface. It really takes advantage of multi-core processing, assembling tens of millions of reads to a reference sequence in minutes on a desktop system. And the strong user community means that help is not far off—hours after I posted a thread about a task I wanted to do, another user had a perfect solution! Finally we have an integrated system at an affordable price for all our DNA sequence analysis needs. Thanks, Geneious. Geneious is the perfect combination of ease-of-use and bioinformatic refinement. 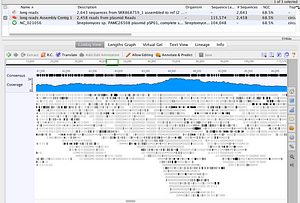 Students easily grasp many of the concepts of bioinformatics because the sequence data is visualized so well. As researchers, we routinely use its functionality to perform data analysis on real data. 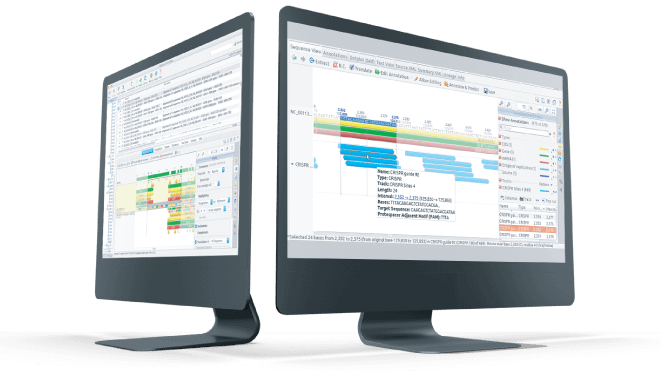 Discover how Geneious software and services can help you simplify and empower sequencing research and analysis.